New to Light/Sound Relaxation and Stimulation? 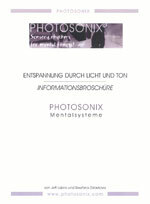 PHOTOSONIX recommends that you read the information we offer in this short booklet. An easy to understand guide for beginners, it includes general information on light and sound as well as listing features and choices of the current PHOTOSONIX models and their respected use. Included in this booklet is valuable information on selecting a model to suit your needs and maximize the benefits from your Light and Sound Relaxation experience. Enjoy! We recommend Awakened Mind by James Mann. It contains a wealth of information on the use of dual binaural beats in designing light/sound sessions. Awakened Mind $45.00+s/h. Confused about some of the terminology? Specific information about light and sound relaxation terminology can be found in the Light and Sound Relaxation Terms Glossary. 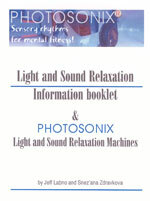 For short overview on the various models from our product line, see PHOTOSONIX Relaxation Products information. For more specific information about a certain model (like features, lists of the sessions, pictures and accessories), please follow the individual model icons or check out our Feature Comparison Chart.